Optical engineering uses classical optics techniques to create novel devices and instrumentation, and the College of Optical Sciences leads the field in designing and fabricating highly specialized optics. OSC maintains state-of-the-art facilities and a superb technical staff for grinding, polishing, measuring and aligning the world’s most challenging mirrors — including those for astronomical telescopes. Students work side-by-side with experienced professionals on extensive, distinctive projects like the Giant Magellan Telescope, the Large Synoptic Survey Telescope and OSIRIS-REx, an unmanned space probe that will launch in 2016, land on an asteroid and return to Earth with a material sample. 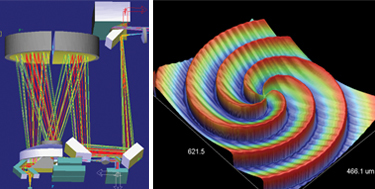 To view past updates, see the Optical Engineering Updates Archive page. The LIDAR system measures the position of a moving object. A recent publication from the Takashima Lab on LIDAR is ranked as the 7th of the most downloaded papers in Optics Express in April 2018. The research team demonstrated a LIDAR system which remotely identifies location and distance of moving objects with a high sampling rate of 3.4K points/s. The new laser beam steering concept is expected to replace a bulky and slow scanning LIDAR system with a fast and light-weight one that can be a mass-produced Micro Electro Mechanical System (MEMS) device. An example of how the LIDAR system measures the position of a moving object suspended from the ceiling. 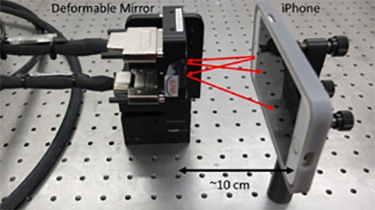 Deformable mirror (DM) test configuration using the iPhone. Rays drawn in red arrows represent the time-reversed paths to show the as-used section of the screen. The Large Optics Fabrication and Testing (LOFT) group under the lead of Dae Wook Kim has developed a new instantaneous deflectometry technology, which they implemented on an iPhone (see Trumper, Choi, and Kim, “Instantaneous Phase Shifting Deflectometry,” Optics Express 2017). This development enables high precision snapshot measurements of time-varying surfaces, such as a deformable mirror (example in figure) or active bending modes of a large optic. Phase shifting deflectometry now has the capability to measure dynamic optics. Deformable mirror surface measurement made at ~10 Hz using instantaneous deflectometry implemented on an iPhone. The Large Optics Fabrication and Test (LOFT group PI: Dae Wook Kim) group developed the Simultaneous Multi-segmented mirror Orientation Test System for segmented optics application (H. Choi, I. Trumper, M. Dubin, W. Zhao, and D. W. Kim, Opt. Express 25, 18152-18164 (2017).) The localized 2D sinusoidal patterns are displayed on the screen and the CMOS camera captures the images reflected from each segment. Due to its high computing efficiency and accuracy (15 Hz, 0.8 µrad), it allows a dynamic monitoring and controlling of a multi-segmented optics system or a closed-loop optical system with a long-term stability requirement. Left: Partial view of instrument for acquiring corneal topography. Right: Interferogram of a test sample. The Aspheric Metrology Laboratory headed by John E. Greivenkamp designs and builds advanced interferometric systems for metrology and optical testing. Research interests include ophthalmic and visual optics, ophthalmic instrumentation and measurements, interferometry and optical testing of aspheric and freeform surfaces, optical fabrication, optical system design, optical metrology systems, distance measurement systems, sampled imaging theory, and optics of electronic imaging systems. Demonstration of realistic cues for 3-D displays. Hong Hua's 3-D Visualization and Imaging Systems Laboratory specializes in a wide variety of optical technologies enabling advanced 3-D displays, 3-D visualization systems and collaborative immersive virtual and augmented environments, and novel imaging systems for medicine and surveillance applications. The 3DVIS Lab also uses 3-D displays to better understand human visual perception and visual artifacts and investigates design principles for effective human-computer interface in augmented environments. Left: Lithography tool. Right: Measurement of micro-optical structure fabricated by Milster lab. Tom D. Milster's research aims to "push the boundaries of optical science and engineering to produce the maximum amount of information from a given volume of space and time." His group designs, simulates and fabricates custom computer-generated holograms, Diffractive Optical Elements, phase structures and amplitude masks. They investigate hyper-numerical-aperture linear and nonlinear microscopy, where the NA is greater than 1.5 and evanescent waves provide resolution well beyond conventional microscope limits. They are also interested in the development of "freeform" holography, with DOEs adding function and utility to 3-D structures. Unique instruments in the lab include a vacuum-ultraviolet microscope at the 121.6-nanometer wavelength and a high-resolution infrared microscope for determining subcellular metabolism. Research applications include industrial inspection, graphene characterization, metamaterial testing, data storage, lithography, and bio-film and subcellular imaging. 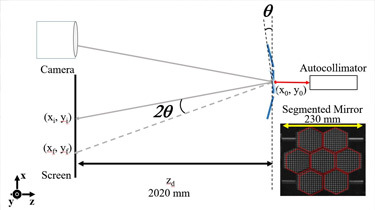 Lens design of wide-field and hyper-high-numerical-aperture projection system. 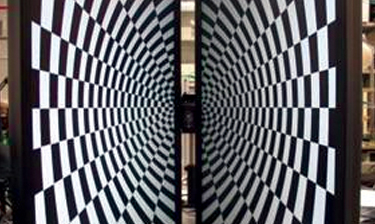 José Sasián's Optical Design Laboratory conducts research in optical design, including imaging and nonimaging systems; optical aberration theory and novel methods for aberration correction; illumination optics; aspheric surfaces; optical testing methods and modeling; optomechanics; optics for lithography; microscope design; optics for visual systems; light in gemstones; and modeling light propagation in optical systems. Specialized screen for visual assessment. The Ophthalmic and Visual Optics Laboratory led by Jim Schwiegerling designs and fabricates instrumentation for assessing various properties of the human eye. These devices include wavefront sensors for measuring aberrations of the eye and topographers for measuring the three-dimensional geometry of the corneal surface. 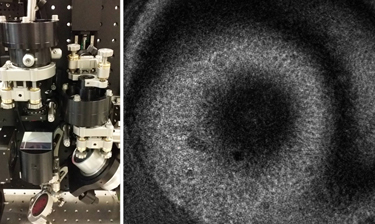 The lab has developed novel retinal imaging techniques incorporating both polarimetric and spectroscopic measurement of the retinal tissue. Schwiegerling’s group is also expanding usage of these core technologies to address needs in the fields of optical design and testing, biometric identification and computational photography. 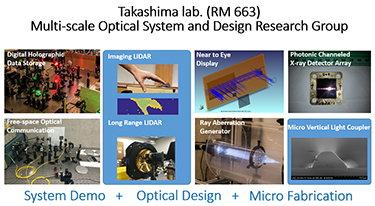 The Takashima Lab is currently working on Digital Holographic Data Storage, Imaging and Long-Range LIDAR, Near to Eye Displays, Photonic Channeled X-Ray Detetector Arrays, Free-Space Optical Communications, Ray Aberration Generators and Micro-Vertical Light Couplers. 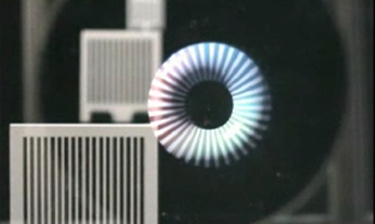 Yuzuru Takashima's laboratory constructs innovative optical devices through a wide spectrum of optical science and engineering techniques. Research topics include the design and fabrication of nanophotonic devices, micro-optics, network-based optical input-output devices, and optical and holographic information storage. Among additional areas of interest are X-ray phase contrast imaging, ultrawide field-of-view imaging, micromirror fabrication, CMOS-compatible packaging for silicon photonics and heads-up displays for mobile applications.